McGill Innovation Week took place for a third year in a row this November and the third time was certainly a charm. Nineteen events integrated the McGill student and faculty community with the Montreal innovation community to demonstrate how people can collaborate to create novel ideas that will drive our future. McGill Innovation Week took place for a third year in a row this November and the third time was certainly a charm. Nineteen events integrated the McGill student and faculty community with the Montreal innovation community to demonstrate how people can collaborate to create novel ideas that will drive our future. On campus, students learned from Montreal innovators and worked together to generate their own innovation in a way that positively affects McGill. Off campus, students gained access to Montreal’s Quartier de l’Innovation (QI) providing first-hand experience with our city’s entrepreneurs, start-ups, incubators, accelerators, and integrated community projects. Tucked away in Montreal’s Sud-Ouest, the QI is a crossroads of the cultural, artistic, economical, technological, and multimedia forefronts of the city. Isabelle Péan, Director, Innovation and Practice at McGill, explains, “QI represents a modern ecosystem that responds to the new realities of the innovation challenge on a worldwide scale.” McGill is tightly partnered with this ecosystem and the Innovation Week allowed students to both discover the potential that QI has to offer and to interact with the organizations within it. 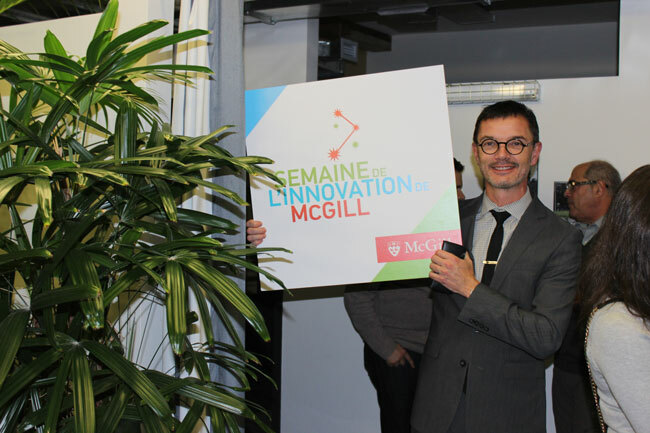 On Monday, Vice-Principal (Research and International Relations) Rosie Goldstein joined students and community members to introduce the official opening of McGill Innovation Week 2015. Following the opening remarks, Goldstein was joined by Alan MacIntosh of Real Venture, McGill professor Steve Maguire, and Samer Saab of eXplorance, to discuss the ways in which innovation at McGill can be tailored to meet the needs of the university and its students. Setting the tone for the week-long series of workshops, events, and competitions, Goldstein stressed the value of empowering McGillians through providing real world experience through exploration of the resources and local entrepreneurial activities within Montreal. Partners gathered Tuesday with Natalie Voland, President of Gestion Immobilière QuoVadis, to celebrate the launch of Le Salon 1861, a co-creation space, event hall, and incubator in QI. Originally built in 1861 as St-Joseph’s Church, Voland has reconstructed the building into a modern collective space that still boasts the beauty of the church’s exterior and interior architectural design. The building hosts entrepreneurial social laboratories, an event hall, and a kitchen and restaurant. Le Salon 1861’s mission is to promote collaboration between its stakeholders which include academic institutions, private corporations, community organizations, and the residents of Little Burgundy. During Tuesday’s event Goldstein announced McGill’s official partnership with QuoVadis. Goldstein expressed how the opportunities at Le Salon 1861 align with “McGill’s mission of supporting and partnering with socially responsible projects, and promoting experiential learning for our students.” Two major projects McGill has been involved with include the Laboratory of Urban Culture and the Social Innovator’s Integration Lab, both designed to serve the Montreal community by promoting collaboration amongst artists, students, educators, and local community members in entrepreneurship and social innovation. McGill’s Faculties of Agriculture, Arts, and Management, and McGill’s schools of Urban Planning and Architecture have and will continue to be involved in the success of the various projects within Le Salon 1861. Midweek, a group of McGill and Concordia students attended a special walking tour of QI which took them through Griffintown in order to experience the start-up community in the city. The first stop was the Centre d’Enterprises et d’Innovation (CEIM), the largest of six incubators in QI, which assists businesses in the life sciences, information technology, new media, and clean and industrial technologies industries. The second stop on the tour included BioFuelNet Canada and échoFab of INGO Innovation Centre. The next stop was a unique opportunity where the group met with the Uber operations team at the company’s Montreal office in Pointe-Saint-Charles. The tour came to end with a walk through of Le Salon 1861. Following the tour was the 5 à 7: Starting Your Business in the QI hosted by INGO. Students from McGill, ÉTS, and Concordia met with leaders of Montreal’s start-up community. According to Silvia Barboza, McGill MBA student and TandemLaunch consultant, “the event brings TandemLaunch closer to entrepreneurs; for us it is critical that students and professionals alike know that there is a place to grow their innovative ideas. Montreal Innovation Week closed with a series of discussions and panels regarding sustainability, civil engagement, as well as the 2015 Thinkathon: Disrupt McGill, a day-long competition in social innovation. The event was organized by the McGill Dobson Centre for Entrepreneurship in collaboration with the Office for Student Life and Learning, with the goal of building a more cohesive campus. The competition brought together students from various faculties who were challenged to create a viable solution to address common needs of the McGill community. With that in mind, organizers of McGill Innovation Week hope to see increased engagement and more innovative events to attract popular speakers in 2016. In order to meet this goal, McGill encourages student groups to participate with their own bottom-up initiatives. Péan is grateful to all participants and is excited about the potential of next year. “I think McGill Innovation Week is really on a growing curve,” she said. If you are interested in innovation at McGill please visit the University’s QI webpage or visit the Facebook page. Matthew Jones is an MBA student at the Desautels Faculty of Management; Tony Mistak is majoring in Psychology in the Faculty of Arts.